Shop Claire's, online at Claires.com, to find trendy accessories for young women. Claire's carries makeup, boots, sunglasses, and all kinds of glam accessories to dress up your outfit. Find hats, handbags, jewelry, gloves, scarves, belts, and lots more at Claire's. With Claire's you can be sure to stay on top of the latest styles popular with tweens, teens, and kids. Remember, RetailSteal.com lists the best Claire's coupons, Claires.com discount codes, and Claire's promotions. 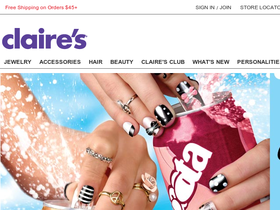 Spend $45 or more at Claire's and get free shipping. See website for full details, exclusions may apply. Shop at Claire's today and enjoy a 10% discount using this coupon code. Plus enjoy free shipping on purchases $45+. Click link to shop and save. Spend $35+ at Claire's and get free shipping on your order. Click link to shop. Shop at Claire's online and find up to 75% savings in the clearance section. Click link and go shopping. Click on this promo link to find handbags at Claire's for up to 50% off. Buy 1 and get 1 half off on hair accessories at Claires.com. Click link to shop and save. Enjoy buy one get one 50% off on cosmetics from Claire's. Click here to shop. Get 30% off all boots at Claires.com for a limited time only. Now at Claire's, buy 2 pairs of earrings and get 1 free. Click link for this great deal. All Claire's flip flops and sandals are now just $8! Enjoy up to 50% savings on select footwear when you shop online at claires.com. Use this coupon code online at 6pm.com and enjoy a 20% discount on your entire order for Cyber Monday.